Kids who play contact sports are at risk of repeated head trauma and concussion. The Centers for Disease Control report that around 130,000 children under the age of 18 are seen for sports-related head trauma every year. Most kids who are diagnosed with a concussion recover; however, new research indicates that repeated concussions throughout childhood and adolescence may cause permanent changes in how the brain functions. This is because the brain is actively developing throughout childhood. Brain injuries take energy and time away from learning and development processes. That time and energy is instead spent on trying to heal as much of the brain injury as possible. Head trauma during sports usually happens from a blow to the head from another player, the ground, or an object. The blow causes the brain to bang against the front and back of the skull. This motion tears nerve cells and can cause bleeding inside or around the brain. 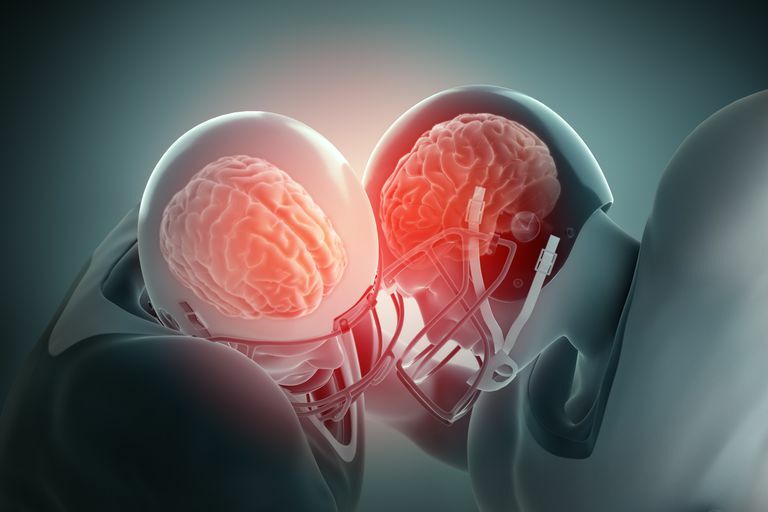 A concussion is a mild traumatic brain injury that may or may not result in a brief loss of consciousness. There may be damage to the brain even if loss of consciousness does not happen, so that should not be the only sign to look for. The brain is still developing during childhood, and skills such as language, critical thinking and problem-solving have not yet been fully established. Each time there is head trauma the brain has to fix the damage; if nerve cells were torn, new pathways of communicating information inside the brain need to be found and learned. Swelling may result in decreased blood flow to lobes of the brain that are responsible for important skills. Nerve cell damage forces the brain to reroute how impulses and information are sent and received. In a developing child’s brain, this may detract from overall learning ability. According to research, it’s dangerous if the head trauma and concussion happen at the same time that essential learning and thinking skills are developing. If the child’s brain is learning problem-solving or critical thinking and this process is interrupted, then these skills may not progress the way they should. The head trauma interferes with the normal learning process. It is particularly damaging if brain injury happens over and over again. Each time the brain is traumatized it has to recover, and if it hasn’t had time to fully heal since the last concussion, this slows or even stops the process. Have adequate time to rest to allow the brain complete recovery. If any of the above listed signs of concussion were present, the recovery time may need to last several weeks. These restrictions are hard for kids to follow, especially if they are active in sports. A couple weeks on the sidelines can change an entire season. However, it is important to remember that repeated head trauma may have long-term neurological consequences and affect a child’s entire life. These include impaired learning, thinking, and reasoning undermining school success as well as the potential increased risk for Parkinson’s disease, Alzheimer’s and other dementias later in life. Yeates KO, Kaizar E, Rusin J, Bangert B, Dietrich A, Nuss K, Wright M, Taylor HG (2012) Reliable Change in Postconcussive Symptoms and Its Functional Consequences Among Children With Mild Traumatic Brain Injury. Arch Pediatr Adolesc Med 166:615– 622. CrossRef Medline.